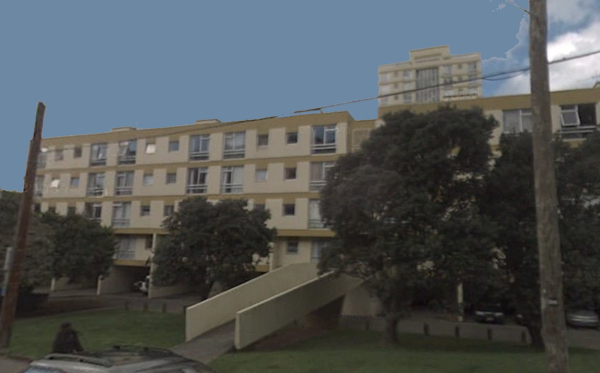 Getting away from all the excitement and kerfuffle of the Christchurch earthquake for a while, and focusing our fish-eyed gaze a little closer to home, the Wellington City Council is proceeding at pace with the modernisation of their social housing stock. 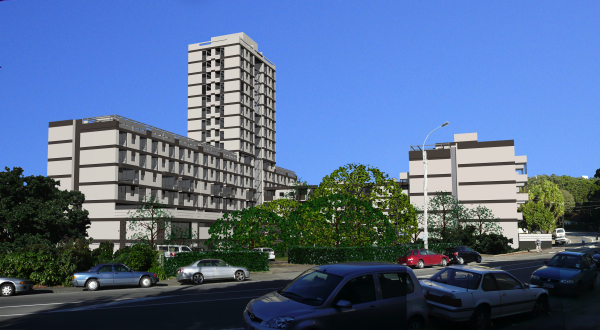 We reported just over a year ago on the plans and aspirations for some of those schemes – in this post here – where we looked at the presentation schemes for one CHUP in Te Aro/Mt Cook (Central Park), and another further east in Kilbirnie (Marshall Court). One of our more amusing exchanges with our readers, if I recall. Robyn wanted to know: “Why isn�t newspaper man paying attention to the waving lady? She might be wanting to invite him up to her house for some quinoa salad. 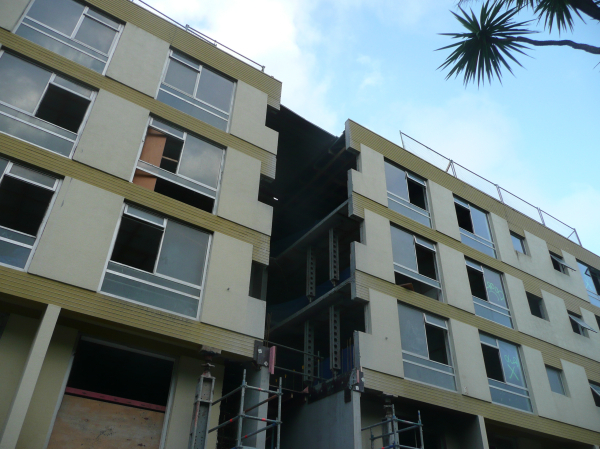 He�s too busy reading the news to see what�s really going on in the world, etc.” In the mean time, Council has completed the first of their projects, over in Newtown, with the Te Ara Hou flats – which were pretty nicely designed already, but are now even nicer. They have been upgraded, and re-occupied by Council tenants, who I hope are suitably impressed that their local government loves them enough to spend time and money doing up their homes. Hope they remember to vote ! I really am excited by the thought of how we will be able to see history with this Streetview tool. Its been just over 10 years since they started their company, and yet it continues to grow and to dominate not just business, but also our view of time gone by. I think Google have announced, or maybe I imagined it, and they will announce it soon anyway: Google Streetview has the ability to have older versions running concurrently – so you will be able to look back in history to views of your street before it was there as it is now. Not just a regular carload of Google Streetview updating every couple of years, but they’re running an algorithm stitching together old prewar (WWII) photos of Europe, so as to recreate for us a virtually seamless interaction with the past. Doubtful we’ll ever have that for NZ, but hey, we’ve got this tool, which enabled me to just go back in time a little. Anyway: who can tell me what is going on here? Unfortunately, the rendering cuts off exactly the bit I want to see, which these photos show. Bother. But ain’t that always the way? I’m picking, and hoping, that earthquake strengthening will have been a big part of this building rework – and probably also a bit of thermal protection as well. 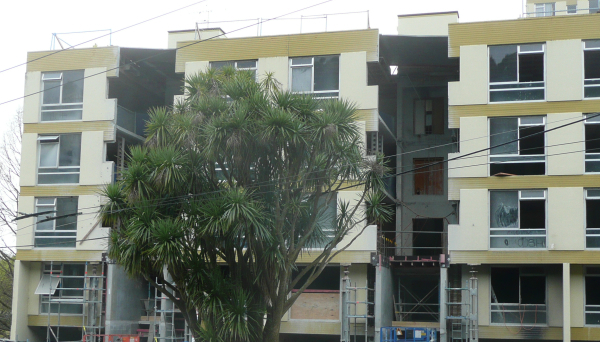 Crikey, look at that solid concrete outer wall: I bet it was chilly in there when the Southerly was blowing. Architects are, umm, Novak and Middleton I think – and Structural Engineers are Dunning Thornton. There’s something fantastic and gutsy and very dynamic about that raw concrete edge being supported by those great big props: I think they must be going to install a precast concrete panel in there as a shear wall, or something like that. Or perhaps a lightweight glass box for them to grow their geraniums in. We’ll be watching with intrigue. 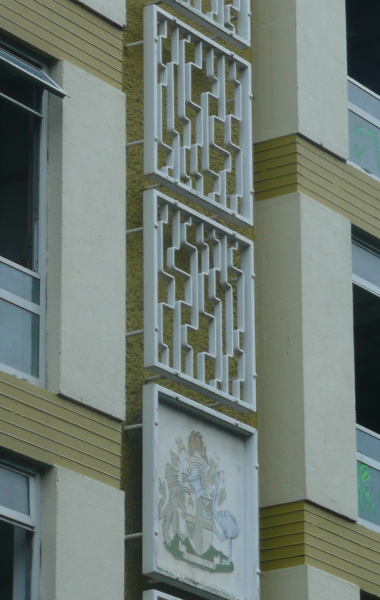 And then of course, to finish us off for the day, there is this lovely Old Skool version of civic pride – the funky designer floating balustrade / artwork, and the City coat of arms. Don’t go throwing that away! That’s a piece of design history right there. While on the subject of the Council and concrete… does anybody know why there is a U-Boat pen being laid down in Manners St? There’s something like half a metre of heavily reinforced concrete being poured into the roadbed. Are we going to be getting some much heavier buses? First signs of post-Christchurch roading specs? I’d assumed it was to prevent the buckling that happens under the weight of standing busses, but it sure is a helluvalot of concrete. Noone will be digging up that street again, hope all the utilities got all their ducts in place. I recall reading that the concrete thickness was designed to resist attack by a sledgehammer wielding pro-Mall protester. I’m hopeful (but not necessarily confident), that the sub-base is being laid down in a thickness capable of taking Light Rail through there in years to come. Really – it is / would be an entirely logical thing to do. There was a recent NZTA paper discussing the merits of concrete roadways vs our standard (and, by international standards, quite shonky) asphalt roads. Concrete roads last way longer – but only if you don’t keep cutting them into pieces and lifting them up. With a bit of luck and good planning, WCC Traffic Dep will have thought of this, and installed a decent set of extra conduit/pipe runs under all the slabs as well, so they don’t have to dig it up (ever) again. Although not connected with either project and this is speculation the M/Mall slab may be over an existing Comms Trench. I understand that one runs the length of most of the Terrace as well. Basically if you have a street criss-crossed with a snotload of services, it makes sense to put the road over a permanent basement that you can string your cables and WHY along – I’m not saying that that is the case in M/Mall, it’s just a possibility. Also Erentz is right that the buses need a thicker roadway surface to stop the deformation that can be seen next to most Courtenay Place bus stops. 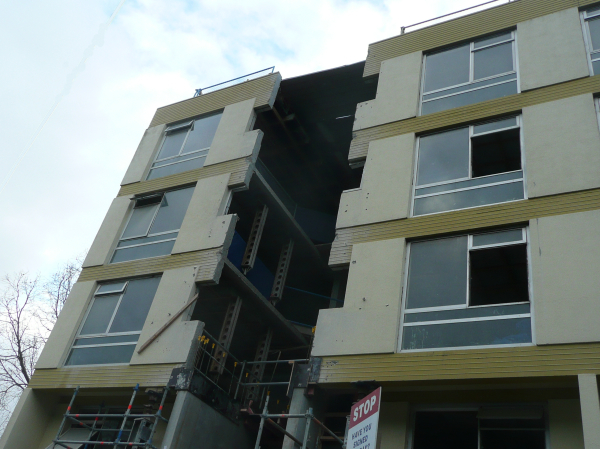 I note that the extensive cutting of the reinforced concrete flats is something that would not have been considered a few decades ago – cutting technology has come on to the point where a lot of contractors have diamond saws. Likewise the Cut-and-Fill Earthworks of the roadway North of Plimmerton leading to Pukerua bay would likely not have been considered in the 60’s as hydraulics didn’t become widespread til roughly then. The glacial fashion change of construction technology. The soils conditions they found when the existing ground was dug up were significantly worse than what they were expecting. Originally it was going to be a lot thinner than what it is now. It looks like there were a few conduits that had been set in the concrete that were for the purpose of future services. Someone I once worked with me once told me about a set of council owned conduits that were laid in Featherston St a few decades back so that utilities could use them without constantly digging up the street. But apparently non of the utilities ever used it, and it filled up with gas, and one day went KA-POP! blowing a manhole cover off. So they decided to fill it with sand. Disclaimer: Don’t know how true that is, or if the years have somewhat altered my recollection of the story. Busy streets are always full of pipes and wires and conduits, and services companies always need to get in and dig them up. Its the way of the world – always has been. I remember in London the papers always had stories about Camden High St – which got dug up something like 250 or 300 times in one year. Motorists irate: commuters at bus stops not much impressed either. As far as I can recollect, there are very few roads with full, underground, walkable conduits in them. Wellington is really unlikely to have any – as they would just fill with water seeing as we are so close to the water table. The only one I know of is in Canary Wharf in London Docklands, where (on massive budget), they designed in a completely separate walkable / possibly driveable underground services route, below the roads above. Its full of wires and pipes and cable and fibre and all sorts – and it works perfectly – and the company went bust owing hundreds of millions. Fun as it would be to drive a bunch of minis through a giant duct under Manners St, it’s not going to happen with what is being laid there. They lifted the cobblestones, dug a moderately deep trench in the dirt below and proceeded to fill it with layers of steel and concrete. True, there are some pipes running through it, but you couldn’t drive much more than a dinkey toy through them. If this is a proper foundation for a Wellington city street, there’s an awful lot of digging to come. Fair call Seamonkey, no tunnel. I take it that everyone here has been through the one under the airport runway though?